Collaborate and share data through VoIP* and Microsoft® Lync. Help protect your critical data and meet compliance standards with Dell Data Protection* and Trusted Platform Module (TPM)* encrypted hard drives and other security features. The OptiPlex™ 7010 desktop is a good fit for businesses that have adequate desktop space and desire a high level of expandability. It includes four expansion slots and two media drive bays. 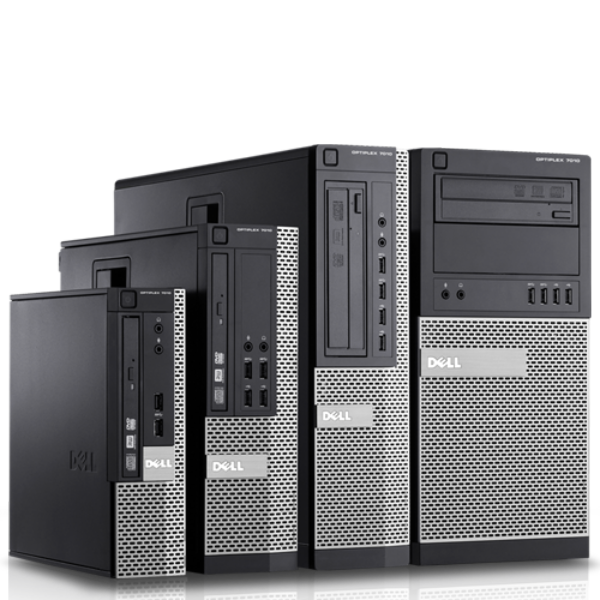 The OptiPlex™ 7010 mini tower helps organizations who make expansion a priority. It comes standard with four bays and four expansion slots, and includes built-in hand grips. The OptiPlex™ 7010 small form factor allows for an AIO stand and is perfect for deployment in small places. The small form factor has two expansion slots and two bays. Standard 240W PSU Active PFC or optional 240W up to 90% Efficient PSU (80 PLUS Gold); ENERGY STAR 5.2 compliant, Active PFC. The compact OptiPlex™ 7010 ultrasmall form factor doesn’t have expansion slots but does have one internal bay. Its diminutive size means it can be deployed in space-constrained locations and out of sight. 200W up to 90% Efficient PSU (80 PLUS Gold); ENERGY STAR 5.2 compliant, Active PFC.